Group places request for brochures on the Fundraising link on main site . Group takes orders for 2 weeks. They collect money at time of order. We will calculate the payment due with the shipping total and email the group a PayPal invoice to the address the order came from. 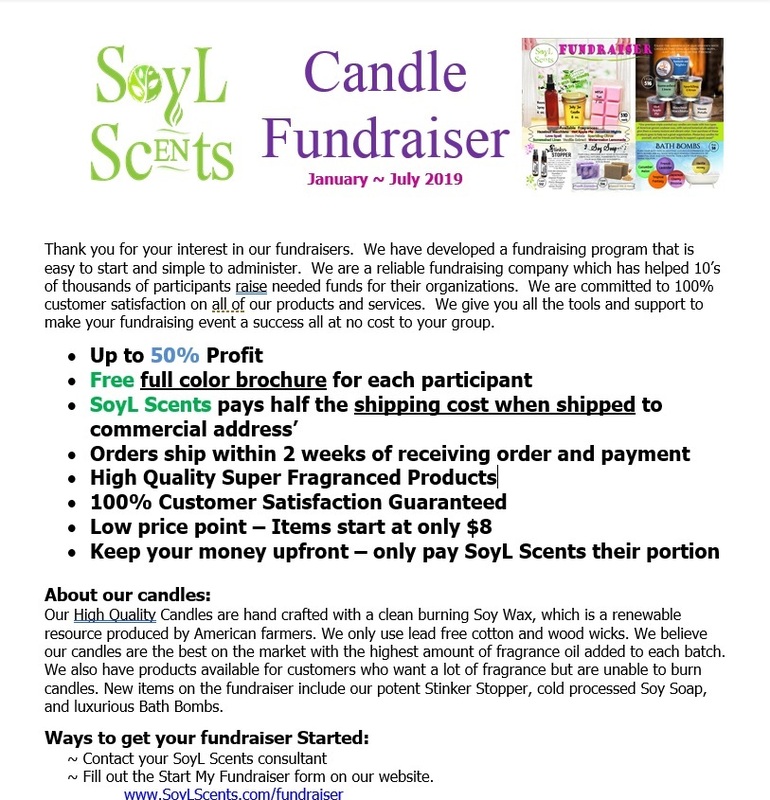 SoyL Scents will pay 1/2 of actual shipping cost for orders shipped to Commercial address' and SoyL Scents will pay 25% of actual shipping for orders shipped to residential address'. Booking affiliate will receive 10% commission on the candle order. If sales are less than 6 items per brochure requested (on average) the group makes 45% of sales, and if the group averages 6 or more items per brochure requested they will make 50%. These MUST be actual group. we will consider 501c3's. We most likely will not do a fundraiser for something like "My daughter is going on a school trip and needs money"
The sales are CATALOG only NO ONLINE orders will be paid out to group. This is a great opportunity for you to get a reorder label with your URL on it to get future sales.